The parts of a tree can be broken down into the roots, trunk, bark, branches, crown, leaves, and periodically flowers and/or fruit. Each part of a tree has a different function from the roots soaking up vital water and nutrients to the fruit continuing the growth of the species. Trees are everywhere. They are probably outside of your home or around where you are reading this. They signify the natural world and showcase the symbiosis of life as birds, squirrels, and even bacteria use them as homes or food. They play important roles for humans as well. We use them to build our homes and the tools that we use to build even more complex things. We use them as sources of food like maple syrup and materials such as rubber. Canada produces 71% of the world supply of maple syrup and has become apart of the social, financial, and cultural fabric of Canada. A tree is considered a perennial plant, meaning that it is long-lived, and is characterized by its leaves, trunk, and roots. When we imagine a tree, we see something that has a tall trunk with roots radiating from it and has a crown of leaves that offer shade from the sun. From oak to pine, trees are taxonomically diverse. What we consider trees are thought to be around over 400 million years old. This time has allowed them to conquer the globe and cement themselves as a crucial part of our lives. It is estimated that there are over 3 trillion trees around the world that encompass terrestrial habitats of the world. Generally, trees can be broken down into four aspects: the leaves, trunk, roots, and their seeds. Leaves form a canopy atop trees that offer shade and are generally green in color. They are an organ of trees that serve multiple functions. They grow out of the branches that extend from the trunk and are usually dense and numerous. Among their functions, the most important is photosynthesis. 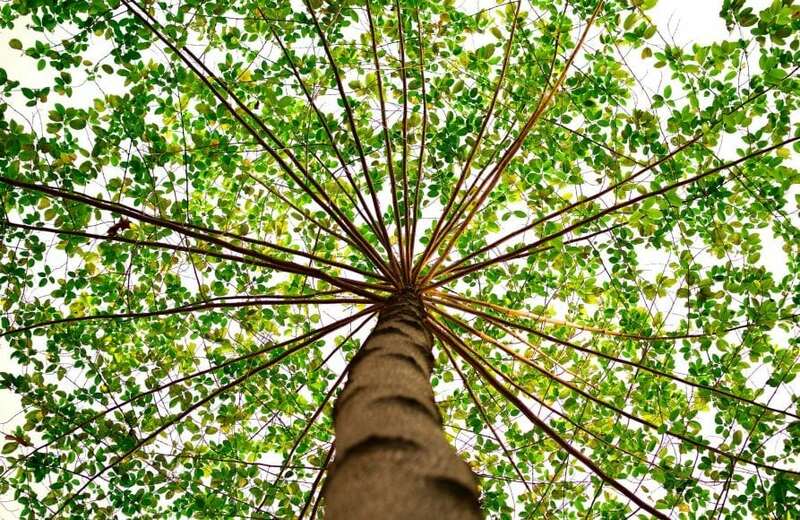 Like other plants, trees get their energy via photosynthesis as they use the light energy from the sun to create chemical energy and produce food. The leaves are where photosynthesis is occurring and why there are at the top of the trees – to capture as much sunlight as possible. They supply the rest of the tree with sugars that they need to grow and extend their roots. They also release oxygen, a byproduct of photosynthesis, into the atmosphere and is responsible for keeping our air clean. Besides photosynthesis, some trees use their leaves to funnel water towards them. They also help to filter out particles as well as remove excess water from the trees. The trunk of a tree gives it the shape that we generally see as well as supports the leaves. It acts as a bridge between the soil and the leaves as it transfers water and nutrients from the soil to the leaves. The trunk is composed of different parts that include the bark, cambium, xylem, and heartwood. The bark is composed of an outer layer, which is what we see, and an inner layer called the phloem. The outer bark is made of dead and worn out cells that protect the more delicate interior from the environment, insects, and disease. The inner bark contains a network of tubes that carry food in the form of sap (sugars and nutrients) from the leaves to the rest of the tree. The cambium is a thin layer of cells that either becomes the inner bark or the xylem. It is what causes trees to increase in diameter and ensures that each trunk layer receives an adequate amount of cells to continue their function. The xylem (or sapwood) is the reverse of the phloem. It brings water and nutrients from the soil to the leaves and rest of the trees. It is the youngest layer of cells. Over time, xylem stop functioning and die out. When this occurs, they concentrate at the center of the tree and become the heartwood. The heartwood is important to the structural support of a tree. 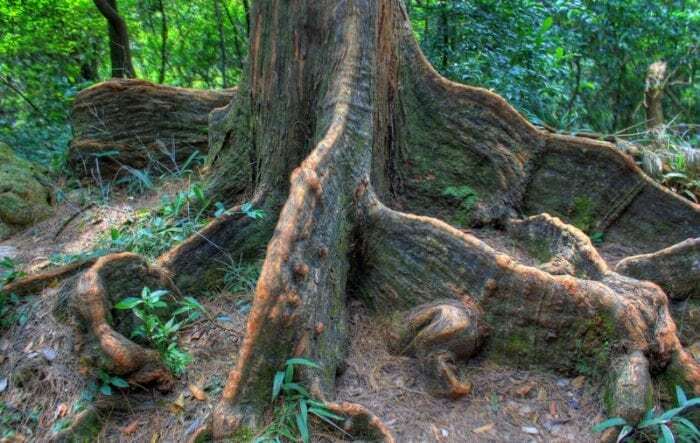 The roots of a tree are the contact point between the soil and the tree. They absorb the water and nutrients that the xylem carries to the rest of the tree. These roots are generally large, numerous, and underground. They help to support the tree as it grows because trees can become very large and heavy. As the roots extend into the earth, they spread out and have hair-like structures on them that allow easier absorption of water and nutrients. Generally, roots do not go deep into the soil (however some can have deep tap roots) because they have to remain where oxygen is to ensure their survival. Roots are very strong and are known to disrupt their surrounding in the process of biological weathering. They move the soil, rocks, and manmade structures out of their way as they search for water and nutrients. Trees reproduce by releasing seeds into the environment. Since they need sunlight to grow and thrive, seeds that are dropped around an adult tree will likely die because it cannot compete with the adult tree for sunlight and resources from the soil. Seeds are as diverse as trees as evolution has resulted in the development of a wide array of seeds to tackle different environments and methods of distribution. The most commonly known carriers of seed are the cones, like pine cones, that we see scattered in parks and around trees. There are seeds with wing-like structures that allow them to capture the wind to carry them away from the adult trees. There are seeds small enough for birds to eat and digest far away from the adult trees. Regardless, they all serve to spread the genetics of a tree and allow it to survive and thrive. As we face deforestation and environmental issues that hinder the growth of trees, it becomes important to continue to understand them and ensure that future generations will have a chance to bask in their beauty.